The impact of recent economic events have left us questioning how reasonable is to spend an awful amount of money on motoring, a very expensive passion as well as a necessity that is a constant source of financial pressure. As we're still in the Christmas spirit, we want to publish a heart warming news from the States that might make our sour feelings towards the soaring automotive expenses a little less daunting and tell the story of a (wealthy) car fan, who proved a remarkable and deep affection for his own special vehicle. In 1928 Allen Swift received a Rolls Royce Piccadilly P1 Roadster as a gift from his father, to congratulate him on his graduation. Mr. Swift lived in Springfield, Massachusetts, the town where from 1920 to 1931 the British manufacturer built and assembled 2,944 cars, trying to establish its name in the U.S. The precious car was perfectly kept until 2005, when Mr. Swift passed away at the age of 102. In 78 years of use, the green-over-green soft top Rolls Royce had covered almost 275,000 km (170,000 miles), undergoing regular services and plenty of MOTs. In 1988, the American motorist got also to rebuild the engine and restore the entire car body. In 1994 Rolls-Royce awarded Mr. Swift with a crystal Spirit of Ecstasy to mark his long lasting relationship with the roadster. 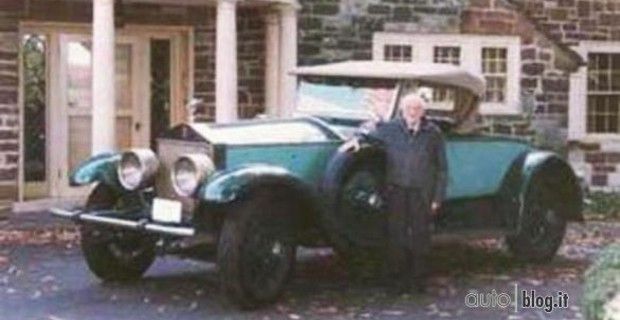 Shortly before his death Allen Swift donated his car to the Lyman & Merrie Wood Museum of Springfield History, along with a substantial payment of $ 1 million, in order to maintain his cherished Rolls in top-notch conditions. The Piccadilly P1 Roadster is now the main attraction of a new exhibition dedicated to collectable cars, displayed at the Transportation Collection gallery.